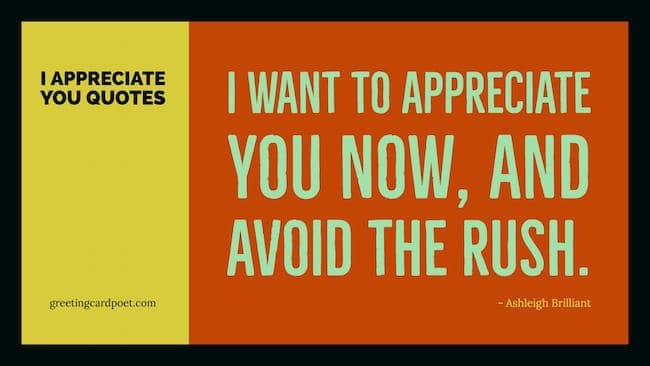 These “I appreciate you quotes” are a fun resource to access when you need to express your personal thanks. Getting appreciated is one of the most important human emotional needs. Even when someone does the smallest thing to help you, make sure you appreciate that gesture. Whether it’s a friend, a loved one, a colleague or anyone else, an appreciation can not only make them feel great, it can also mean you will earn their respect, friendship and love for the future. It doesn’t cost you anything to appreciate someone, so be as generous as you can. Here are some beautiful, I appreciate you quotes you can share with others on different occasions or moments. Whether it’s a long-standing relationship that you want them to thank for or a deed, you can find the right quotes to appreciate them. I appreciate you more because of the road I have traveled. My story brought me to you, and I wouldn’t revise a word of my past if it led me anywhere but to your door. America, I appreciate you liking me. I appreciate your applause, but I don’t do it for applause. I do it for cash, it’s much better. You have to surpass the levels of success that you have already achieved, and that’s the challenge. But, it’s a welcome challenge. I appreciate it because it brings the best out of me. You completely unscatter me, and I appreciate that too much. Now that the war is winding down, I want to say I do appreciate you fellows hanging around here – just for me. Tip: These “I appreciate you” quotes and sayings make great photo captions on social media. Your help has been invaluable to me, and I don’t know how I would have managed without your help and support. Again, thank you so much. I sincerely appreciate your generosity. I thank my lucky stars that you are in my life. I really appreciate the time you’ve taken out of your busy schedule to help me out. Everyday morning I open my eyes the first thing I say is that I appreciate you God for this amazing life that I appreciate so much. It’s not what you appreciate; it’s that you appreciate. Say Thank You in Spanish, French and German. Countless are your deed of loves, countless are your cares you shown. You are a reason to my greatness in life. I appreciate you very much. I appreciate you, and am thankful to know you! I appreciate you and the many years of friendship you’ve provided. Just wanted to write and say I love you and I appreciate you and I think you are amazing! They are right who says, ‘great friends are not common’. I must have found favor to know you. Thanks for being there for me. How I have come to appreciate your many skills! I want to thank you. I count on you again and again. Never stop being you. I appreciate all you do, my dear friend! I appreciate your compassion and understanding. If you ever need a friend to listen to, I’ll always be here to return the favor. 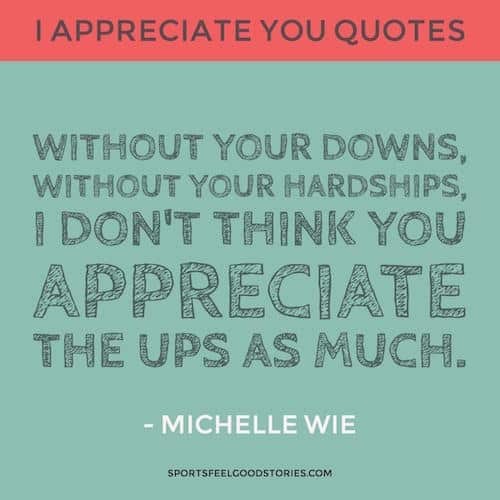 Without your downs, without your hardships, I don’t think you appreciate the ups as much. When it comes to true friendship, I couldn’t have asked for a better friend than you. I’ll always appreciate our connection. Okay, I’m flattered, I appreciate your attempt at making me feel better after the fiasco with the pita rolls, but please ring up this beer I need it more than flattery. I appreciate you because you’re always there for me even when I’m unsure of why I deserve it. How much I wish I could tell you, Dad How much you mean to me…. But there are no words to say How much I admire you… appreciate you… thank you for everything you’ve done. I woke up today with gratitude on my mind and heart. I appreciate you just because. Thanks for being a friend. (The Hack-A-Shaq is) just a way of telling me that you can’t stop me. Thank you. I appreciate it. I don’t think it’s the fans, I think it’s the fact that they get paid a lot of money for a picture of you doing something wrong. They don’t seem to be interested in anything good any more. I think people appreciate what you do. Take a moment to appreciate how awesome you are. I don’t expect anything in return when I give you a gift or simply attention. I do it because I want to show you that I appreciate you being in my life. Dear God, I am only what you made me and I appreciate everything that you gave me, but like, I don’t want to do it any more, sort of lost sight of what I’m doing it for. I appreciate people who are patient with me while I am distant and trying to figure things out. If you have any ideas for our I appreciate you quotes page, please let us know via the contact page. Thanks.